For Waders and Bivvies etc. 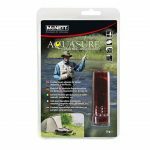 With Aquasure® by McNett® you can easily repair tears and rips in your favorite waders, bivvie and outdoor equipment. Aquasure is a clear, waterproof adhesive and sealant, specially formulated for the flexibility, adhesion and abrasion protection you need to keep you going. Don’t let a rip or a tear stop you. 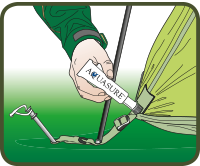 Aquasure will patch that hole in your raft, fix the gash in your fishing waders and make sure you stay dry. Aquasure is all you need to keep your gear going as long as you do. 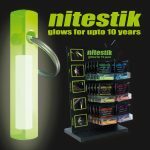 Ideal for infield or home repairs to bivvies and waders etc. Aquasure® urethane rubber adhesive provides a clear, strong and flexible finish suitable for permanent waterproof repairs to holes, tears or leaking seams in most types of fishing and water sports equipment, i.e. Neoprene or breathable waders, bivvies, umbrellas, tents, nets, luggage, rucksacks, clothing, sleeping pads, canopies, hammocks, footwear etc. 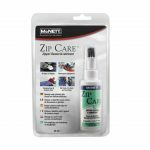 Provides a clear, strong and flexible finish suitable for permanent waterproof repairs to holes, tears or leaking seams in most types of fishing and water sports equipment, i.e. 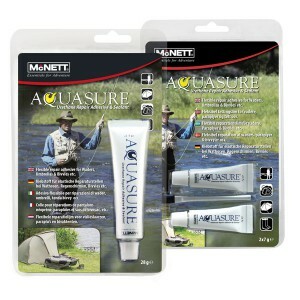 Aquasure® is part of the McNett GEAR AID™ product range. 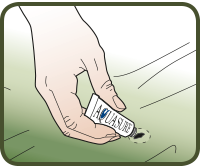 Apply Aquasure® to tear on inside of wader and 6 mm beyond the tear. Cures over night. For instant infield wader repairs, use the Aquasure® Instant Repair Kit. 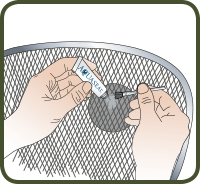 Apply a patch over tear on outside of wader. Apply Aquasure® to tear on inside of wader and 6 mm beyond the tear. Cover with another patch. 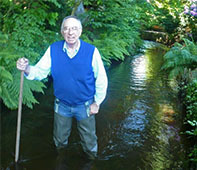 Waders can be used immediately. Patches can be removed after 2-3 days. 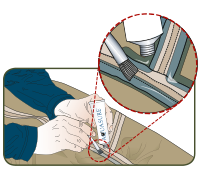 Use Aquasure® for repairing wader seams. 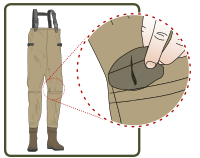 Turn waders inside out and examine seams and fabric for gaps. Apply Aquasure® directly to the seam, extending over seam and on to fabric by 6 mm. Use brush to work Aquasure® under fabric folds and into stitching. Allow Aquasure® to cure for 8 to 12 hours. 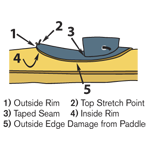 Use Aquasure® to repair felt soles. To repair peeling felt soles, clean and dry peeling area. Apply Aquasure® in gap and close. Can also be used to attach new felt soles. Use tape to hold repaired area closed overnight. Remove tape when fully cured. 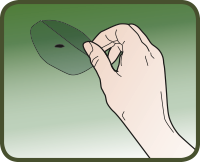 For bivvie or umbrella repairs, apply a patch over tear or hole on outside. Apply Aquasure® to tear on inside and 6 mm beyond the tear. For instant infield bivvie or umbrella repairs use Aquasure® Instant Repair Kit (contains 7 g Aquasure® and 3x McNett Tenacious Tape™ patches). Apply one patch over tear or hole on outside. Apply Aquasure® to tear on inside and 6 mm beyond the tear. Cover with another patch. Bivvie or umbrella can be used immediately. Patches can be removed in 2-3 days. Aquasure® can also be used to repair loose seam tapes and to strengthen stress points. Aquasure® can also repair fishing nets. Use patch to create a backing and apply Aquasure® to the other side. Allow to cure for 24 hours then remove patch. The repair is strong, elastic and gentle on the fish. 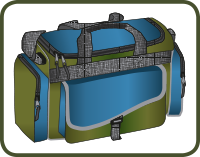 luggage, i.e. 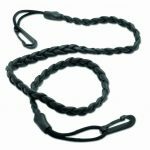 rod holdalls, carryalls, rucksacks etc. 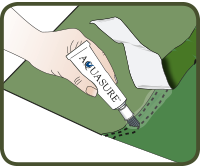 Aquasure® can also be used to coat and protect high wear areas, i.e the base of carryalls, rucksacks, etc. 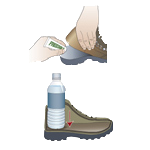 English: I treated the leaking seams of my rubber boots with Aquasure. Perfect result. Now my feet stay dry again. Deutch: Ich habe die undichten Nähte meiner Watstiefel mit Aquasure geklebt. Bestes Ergebnis. Jetzt bleiben die Füße wieder trocken.